Blog Prompt: Today is National Lasagna Day. Do you like Italian food? What is your favorite Italian dish? I love lasagna so much. I have a pretty basic recipe and it works for us. I don’t make it very often because it makes so much and there is just the two of us. So, I usually end up putting half in the freezer for later. Which is a good thing. I haven’t found anything Italian that I don’t like. Even the men!!!! *LOL* I am a pastaholic and love it made in any way, shape or form. I just read on a website about the history of pasta. Very interesting and worth a quick read. I have never made home made pasta, but I have a friend down the street that does it all the time. I can truly taste the difference. She is of Italian decent and she really can cook some good stuff for sure. I love it when she throws a party. But, now adays, I only get wheat pasta. Yes, its brown in color, but I’ve come to enjoy it and you really have to watch it as it cooks. It can turn to mush very quickly. I fixed my famous Pasta Salad the other day while my brother and his family were down for a visit. He loves that salad. Anyway, you are suppose to use tricolor twisted pasta, but I used wheat pasta. He looked at the salad and asked why the pasta was brown. I told him we only eat wheat pasta now and just eat it. It still tastes the same, it just isn’t as pretty as in the past. My brother is one of those people that if it doesn’t look the same, it can’t possibly be any good. He ate at least half of that huge batch I made. I recently saw a great recipe on the food network and wanted to try it out. Since these are rolls, I think it will be so much easier to serve. I can NEVER serve lasagna without it falling apart when I take it out of the pan. Butter a 13-by-9-by-2-inch glass baking dish. Pour the bechamel sauce over the bottom of the prepared dish. Lay out 4 lasagna noodles on a work surface, then spread about 3 tablespoons of ricotta mixture evenly over each noodle. Starting at 1 end, roll each noodle like a jelly roll. 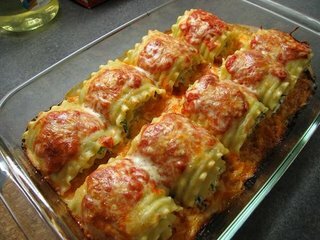 Lay the lasagna rolls seam side down, without touching, atop the bechamelsauce in the dish. Repeat with the remaining noodles and ricotta mixture. Spoon 1 cup of marinara sauce over the lasagna rolls. Sprinkle the mozzarella and remaining 2 tablespoons of Parmesan over the lasagna rolls. Cover tightly with foil. Bake until heated through and the sauce bubbles, about 20 minutes. Uncover and bake until the cheese on top becomes golden, about 15 minutes longer. Let stand for 10 minutes. Meanwhile, heat the remaining marinara sauce in a heavy small saucepan over medium heat until hot, and serve alongside. I wonder how the lasagna rolls would freeze? It ould be nice to fix a batch and freeze it for later since I would be the only one eating it now.